A circular saw is one of the most useful tools a professional carpenter or a D-I-Y'er can own. DeWalt Circular Saws can bring to you that and much more. DeWalt Circular Saws can be used to cut grooved floorboards, rebates, chamfers or miters at any angle up to 45 degrees. DeWalt produce great heavy-duty circular saws. Liked by users for their durability and performance, These circular saws cut log with logic with their convenient to use range of saws. Thus, they are an eye candy for many operators who use saws just once or twice in a year. DeWalt presents a wide range of circular saws; some of them are listed below with their merits and demerits. DeWalt Saws with 7 ¼ inch blade is a heavy-duty saw which also includes some features not available in some other models such as an electric brake. There is a fence/shoe adjustment that helps while working on those speed square cuts. A feature, not yet seen in many or, any other circular saws. Users also say this saw comes with a precise and clear angle and depth adjustment and smooth yet powerful motor. The drawback noted, is that it is heavy, and the height adjustment is rough and painful. DeWalt states that the blade is factory adjusted, which is not and adjusting the blade for trueness gets disconcerting. DeWalt Heavy Duty 7 1/4 Lightweight Circular Saws deliver great performance and feature a 2,200 MWO motor powerful enough for the toughest applications. These 9.5 lb saws are light in weight and are ergonomically designed to decrease user fatigue and thus increase productivity. A criticism though with this saw, is that the forward grip is too small which reduces its effectiveness, especially while retracting the blade guard. Furthermore, the sole plate connection is too flexible. Bare-Tool DeWalt 36 Volt Cordless Circular Saw is not harsh on the user's wrists when trimming gable ends especially while doing work up on the ceiling. The blade lock on these DeWalt saws do not slacken off while at work, even while cutting deep. These saws have also been rated as a 100 percent dependable on the jobsite and field, for its powerful force, an awesome blade brake and high battery life. The downfalls with these saws are the position of the safety lever which makes it inconvenient to push when needed. It has a cheap plastic lock down stud nut for blade depth adjustment and a blade guard. The DeWalt saws with Heavy-Duty 15 amps 7 1/4 inch blade are hypoid which are solidly built and is fantastic for all applications. As per reviews the saw is the top rated heavy duty circular saw present today. Although, the saw is heavier than the sidewinder saw, it is easier to cut sheet stock in many cases. 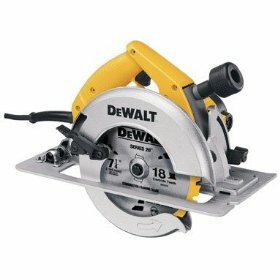 These 13lb DeWalt circular saws are a favorite among professional carpenters for its smooth performance. A desire for this saw though, is a longer warranty period than the already available 3-year warranty. DeWalt Circular Saws are liked by users for their durability and performance. Usually a favorite with professional workers for heavy duty performance, they also make a great buy for those first timers in wood framing. Return From DeWalt Circular Saws Page to Home - Finishcarpentryhelp.com.